My childhood breakfast memories involve cereal. Weekend breakfasts included pancakes, but busy weekday breakfasts were a bowl of cereal and milk. My siblings and I sat crunching away at the kitchen table while mesmerized by the backs of the cereal boxes. There were prizes to win and points to collect. We each had our favorite cereal and our own box to covet. What was your childhood favorite cereal? Captain Crunch? Frosted Flakes? Cocoa Puffs? 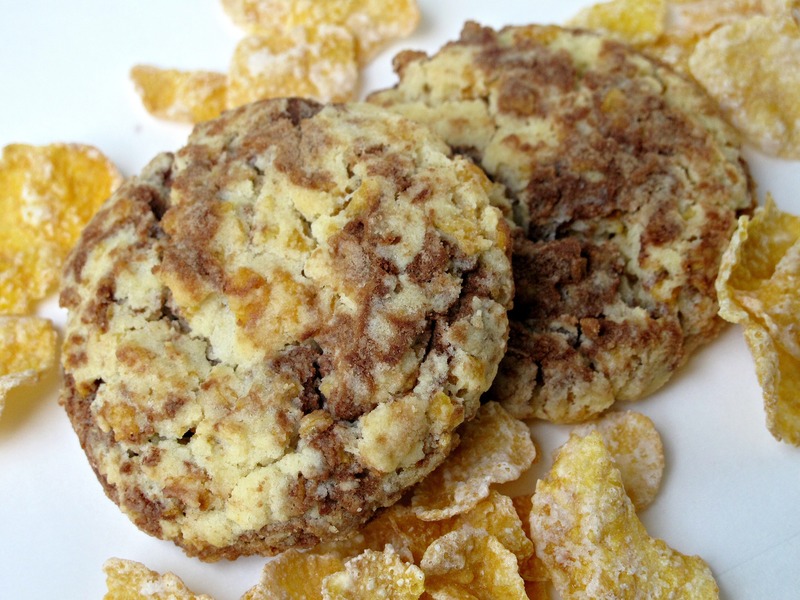 Use that favorite breakfast cereal to customize these crunchy Special Order Cereal Cookies. The summer after my college freshman year, I flew home with no intention of staying there. I love my family and was happy to be with them….for a week or two. The taste of independence that going to school far from home had given me, made being at home less than optimal. My new friends and new life were not in my high school home town. There are rules to follow at home that aren’t your own. Plus, college students like to keep very strange hours. I say this from my own experience and because I have a college student son asleep on the couch as I write this. It is three o’clock in the afternoon. Point made. I was welcome to travel that summer as long as I found a way to pay for it. That is why I donned a bright orange and red polyester uniform dress (this was a long time ago, folks) and went to work for Burger King. Some suggested I was better suited for Wendy’s, that being my actual name and having red hair, but Burger King hired me. I took orders and worked the cash register. The position required minimal math skills and a knowledge of order lingo. For example, many people said they wanted a Coke when they meant they wanted a soda/soft drink. Is that a Southern thing? The order would go, “I’ll have a Whopper, fries, and a Coke. Make that Dr. Pepper.” I also had the misfortune to be asked constantly to sing the Burger King jingle. That was not in my job description but there were actually some customers who wouldn’t take no for an answer. The jingle at the time was, in fact, quite catchy. Burger King was marketing itself as a place where your food was made the way you wanted it, unlike McDonalds where you ate your food the way it was wrapped up or forget it. The jingle included the lines, “Hold the pickles. Hold the lettuce. Special orders don’t upset us. All we ask is that you let us do it your way…..” It was not the most stimulating job I ever held and I smelled like a french fry all summer, but I did make enough money for a bus trip. 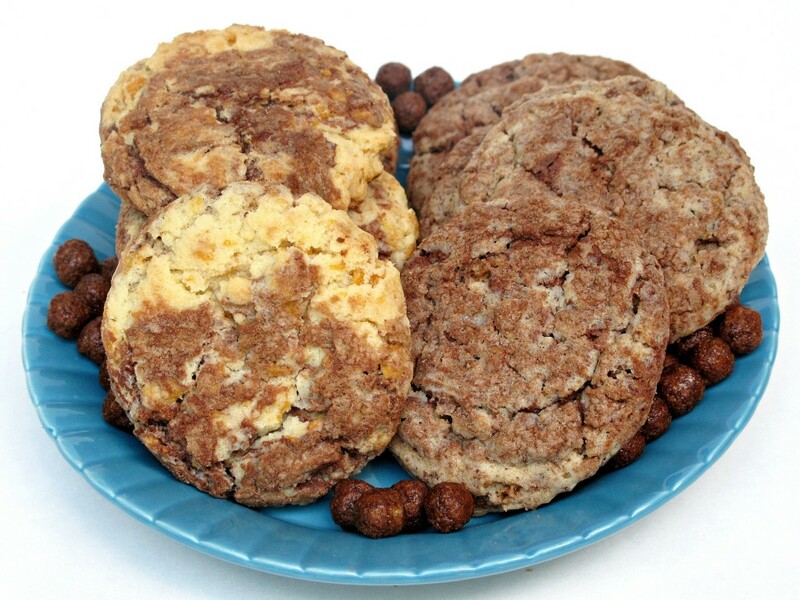 If these Special Order Cereal Cookies had been baked by a fast food place, it would have been Burger King. They are the “do it your way” cookie. The customizing begins with your choice of cereal. 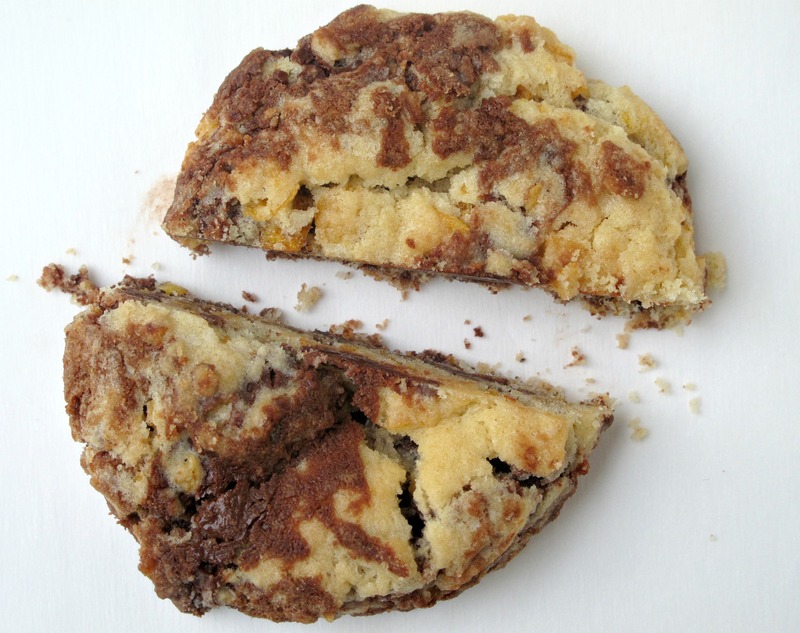 If you like a cereal, you will like it in this cookie. My photos that show a mostly chocolate cookie were made with Cocoa Puffs. The more marbled cookie was made with Frosted Flakes. The customizing continues with your choice of texture. 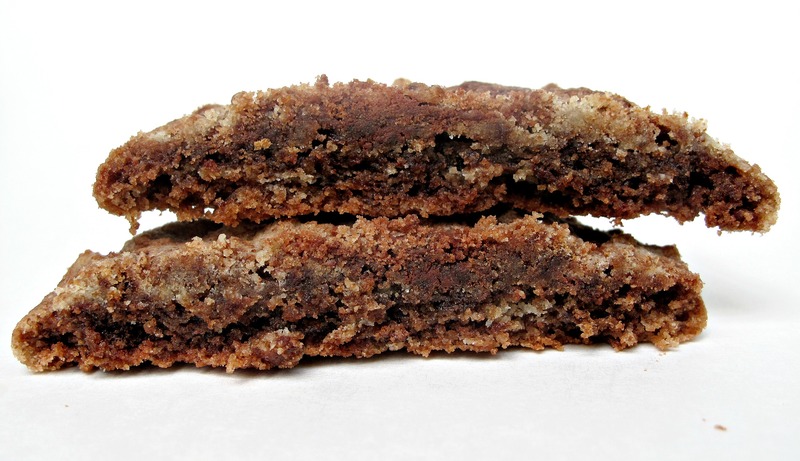 Vegetable shortening (recommended for desert safe care packages) produces a cookie that is crunchy right from the start and maintains its crunch over time. Using butter creates a cookie that starts out with crunchy edges and a chewy center. 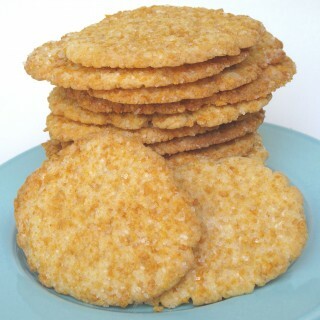 Over time, the butter cookies lose the chewiness. My taste testers each had their favorites. I suggest you add your favorite sugary cereal and “do it your way”. Singing the jingle while baking Special Order Cereal Cookies is optional. 3 cups sugary cereal Frosted Flakes, Cocoa Puffs, Cocoa Krispies, etc. Place chocolate chips in a small microwave safe bowl. Heat for 1 minute. Stir. Continue heating for 10 second intervals, stirring inbetween, until completely melted. Set aside to cool slightly. Place cereal in a large zip lock bag and crush into tiny pieces with a rolling pin. In the bowl of an electric mixer, cream together sugar and butter/margarine/vegetable shortening, until fluffy. Add eggs and vanilla. Mix for at least 3 minutes. Gradually add the flour mixture and combine thoroughly. Stir in the crushed cereal. 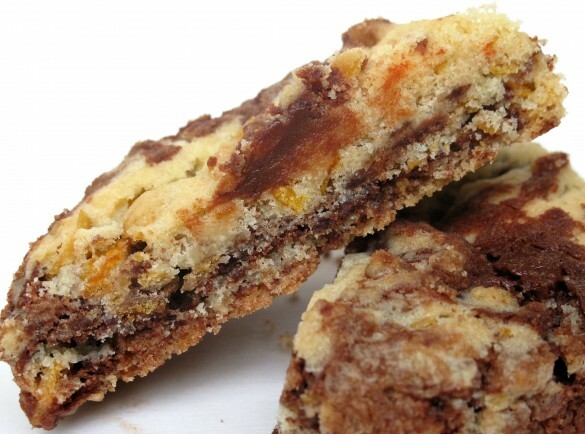 Gently fold in the melted chocolate, leaving ribbons of chocolate throughout the dough. Scoop 2 tablespoon sized (golf ball) balls of dough and place on the prepared baking sheet, at least 2 inches apart. Remove cookies from baking sheet to cool on wire racks. Store at room temperature in an airtight container for at least 1 week. Cookies will get crunchier over time. 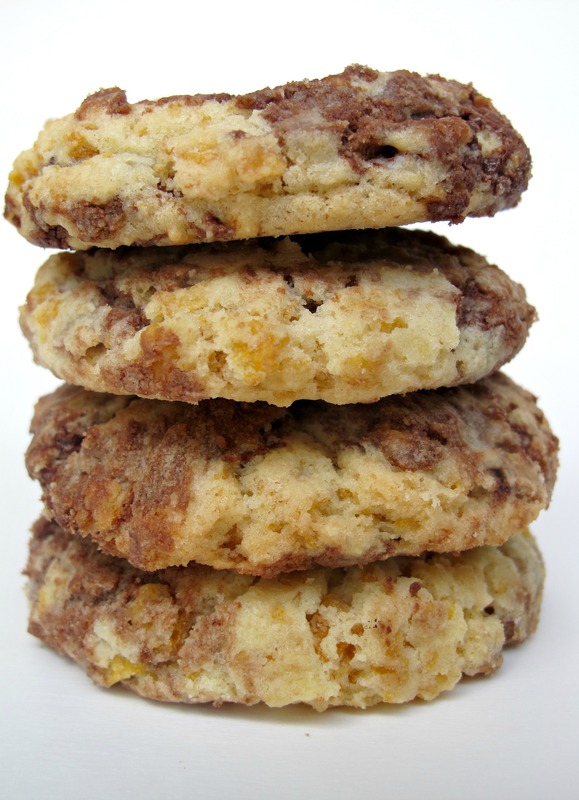 More crunchy,chewy cereal cookie recipes are just a click away! Try these! I love your stories that go with the recipes. I can see why you would have been better suited for Wendy’s but, you singing the Burger King jingle gave me a good chuckle. I still keep college hours, I think it’s just that I’m a night owl and always will be. 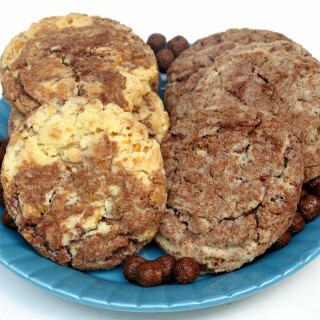 I am thinking of all kinds of cereals that could be made into cookies. I really like the Frosted Flakes one though 🙂 Have a great weekend! Thanks, Suzie! All that singing practice is probably why I still remember the words to that silly jingle! I am an early riser and I guess compared to some, an early to bed person. That is why we say my son, whose hours are so different from mine, must be part vampire. 🙂 Enjoy your weekend too! Gah, that whole Coke = soda thing would drive me nuts! Although not as nuts as the people forcing me to sing the jingle. I didn’t even know BK had a jingle! This brings me back to my days of working at Taco Time. I think every person should have a job in fast food at least once in their lives – it’s gruelling! 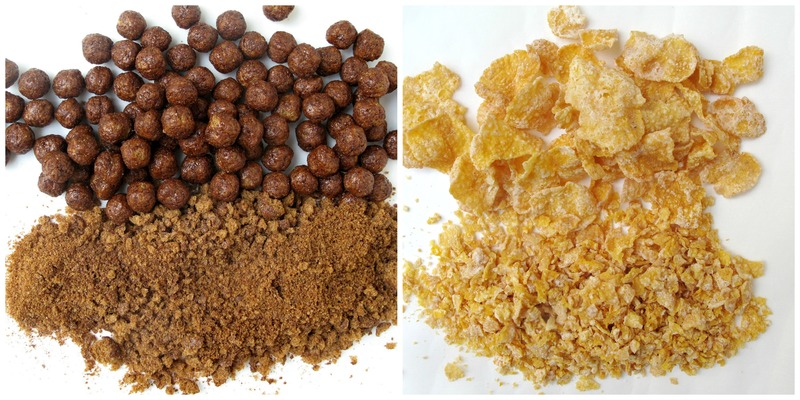 These cookies look incredible – you just happened to use my two favourite cereals when I was a kid. Love these! I agree, Nancy. Working at a fast food place does give you a perspective unavailable elsewhere! Thanks for your cookie comment! I never buy sugar cereal except for baking. 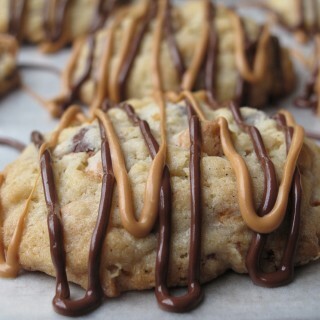 🙂 The flavors and crunch are perfect for cookies! I loved Cocoa Krispies and bet they are super tasty in a cookie. Loved your story of work, family, school and life! I can’t believe people made you sing the jingle! Crazy. These cookies look fabulous! I remember that song! And I love how you applied it to cookies. Cereal cookies? YES PLEASE. Thanks, Dorothy! 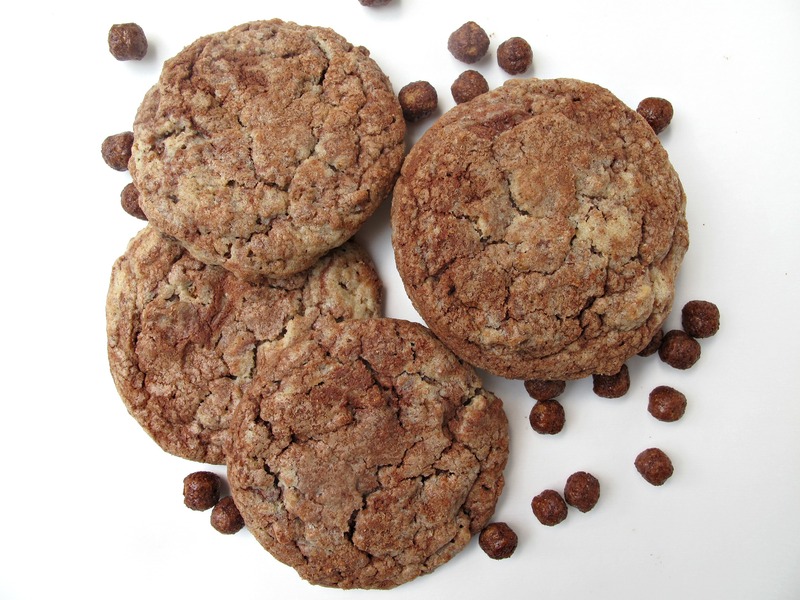 Cereal is a perfect cookie add-in, don’t you think? Crunchy and sweet in flavors found no where else. What flavor is Captain Crunch besides delicious? Wendy, i know from experience that cereal cookies are incredibly delicious; i would bet these are no exception! I like the customizable element to them, also; you don’t always get to do that with a baked good, but being able to tailor them to your own personal cereal loves is delightful. I love the way they came out, especially the marbled ones. Hi Wendy – loved reading that story! : ) I haven’t had cereal cookies yet but I bet it’s really good. I loved Frosted Flakes as a child and I’d love to try it in a cookie! My son would love it, too, I’m sure. Thanks, Monica! The Frosted Flake cookies were my favorite. I had to buy sugary cereal just for these cookies. 🙂 We don’t often eat dry cereal, and when we do it is unsugary stuff like Cheerios and Wheat Chex. But all of the sugary cereals make fabulous add-ins and toppings for cookies, bars, and ice cream! Thanks, Stephanie! Pinterest is amazing! I have found lots of great recipes and great blogs from my Pinterest addiction. 🙂 I am looking forward to following your baking adventures. Those Biscoff bars on your home page had me hooked immediately! Special K with coconut, almonds and cranberries, switch to White Chocolate, best cookies ever by 30 people at a Xmas party. Thanks for the recipe. Fabulous! Your Special Order sounds great, Karen!